On a recent trip to my home town and surrounding area in Northern Michigan, we spent time in the village of Harbor Springs, an historic resort community. It is there that the sliver of peninsula known as Harbor Point, accessible only by the association's horse-drawn carriage, provides a summer retreat for descendants of the old industrial fortunes who built large, gracious "cottages". Adjacent enclaves like Roaring Brook and Wequetonsing contain similar wicker-filled homes, built before the automobile. A handful of Harbor Springs shops cater to such residents, whose idea of roughing it may be taking but one cashmere throw on a sunset sail. 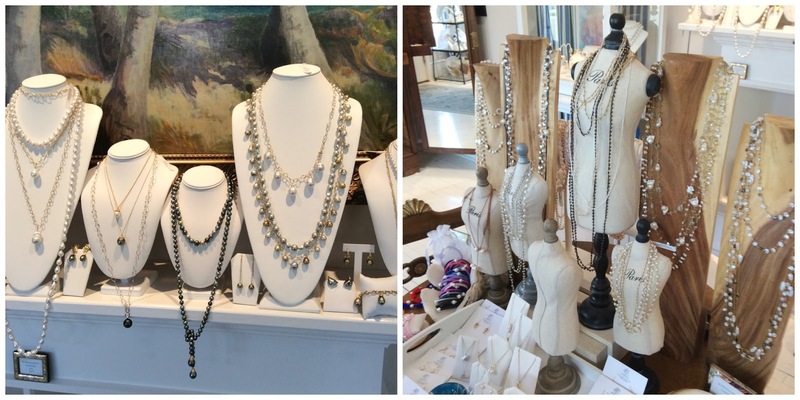 It is in such a setting that we found a tiny, elegant boutique devoted to pearls, Elizabeth Blair Fine Pearls. We stopped by on a quiet September afternoon, warmly welcomed by "Dilly" Blair Kirby herself. 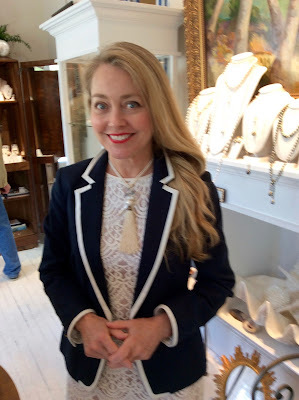 She opened her shop in Harbor Springs knowing that pearls will carry a woman from resort to city, and also shares one of my convictions: they make any woman more beautiful. 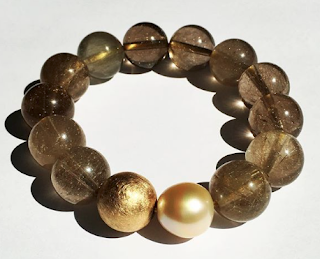 She presents pearls priced from barely three figures to the stratosphere, displayed by theme or mood, each grouping vying with the other for one's desire. 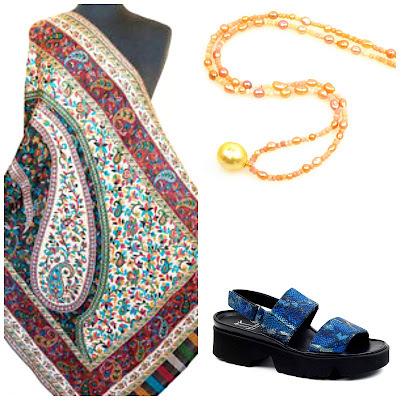 It felt as if a nacreous white cloud had rained pearl treasures on a tiny hamlet. If Harbor Springs is not on your itinerary, drop by her online shop, WestMainPearls.com. 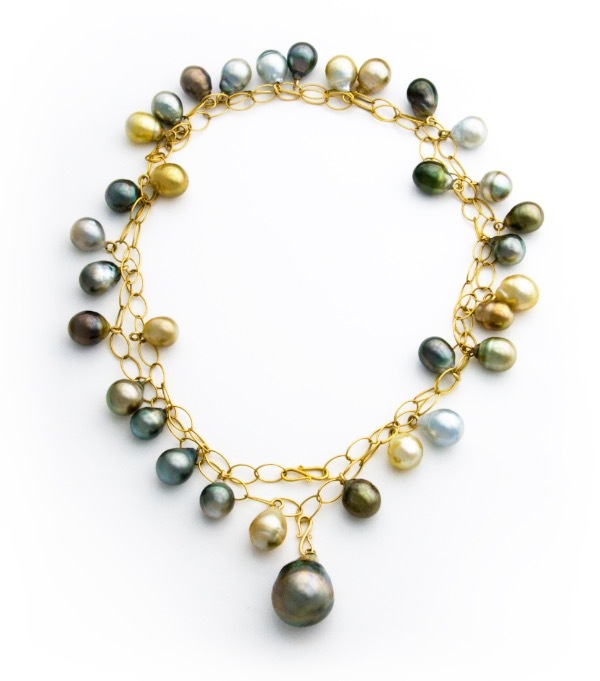 WestMain, a subsidiary of Elizabeth Blair Fine Pearls, features less-costly but still alluring pieces from her trove of every pearl variety. The casual-chic pearls I prefer are stocked on WestMain's site in a range of styles from sleek to ornate. 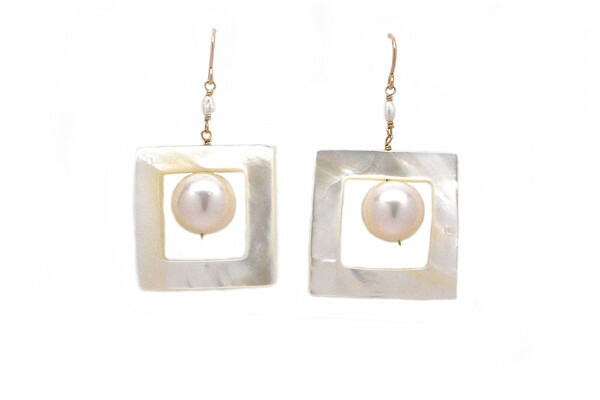 This smart pair of carved mother-of-pearl and freshwater pearl dangles is $195. 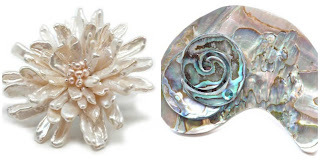 Brooches, often neglected in fine jewellery cases, receive pride of place. 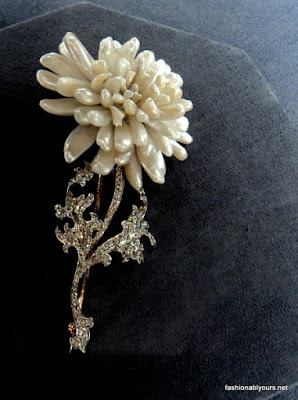 Ms. Kirby showed me her photo of Tiffany's famed pearl "chrysanthemum" brooch, made in 1904 from Mississippi River pearls. 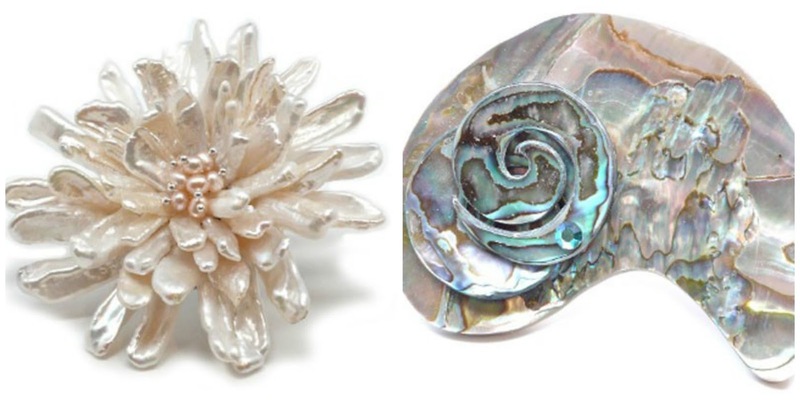 She offers an homage via the charming, classic pearl flower brooch, (price, $295), as well as edgy styles like a modern abalone piece by Sally Bass (price, $325) that can also be worn as a pendant. Pearl rings are a marvelous choice, allowing you to see and enjoy what you're wearing. 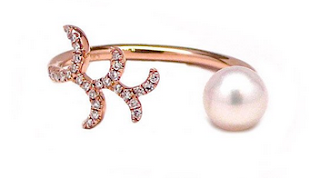 A cultured 6mm Akoya pearl and diamond-accented cuff ring set in 14k rose gold (price $425) is everyday-wearable yet striking. And if you wish to invest in the finest, Ms. Kirby will dazzle you with some of the most sumptuous pieces imaginable. Doesn't every woman have a fantasy of discovering such a treasure of a shop, either to acquire or simply admire—whether filled with books, bikes, jewellery or hand-thrown plates? 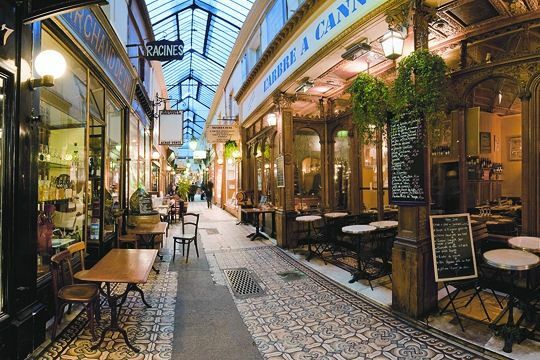 Should that happen, you've found a remarkable refuge from the mass-market world, whether your discovery is modest or luxurious. 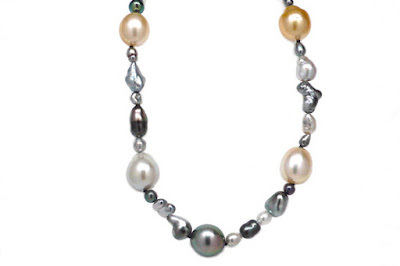 And if pearls are present, double luck! Oh, my! We are up in that area almost every summer (although in a lower-rent neighborhood). I'll be sure to stop in and have a look next time. Thank you for posting about this lovely shop. What a joy for you to find this shop while visiting your home town...serendipity in action. I'll be cruising by Ms. Kirby's website this evening. Oh my! What a sumptuous shop! Off to look at her website...Marci beaucoup. I sense a weekend away in my future... B and I are always looking for somewhere to escape for a few days, and a pearl shop just seals the deal! Thanks for sharing. "Oh my" was my reaction, too! Discovering a unique and beautiful shop like that is the unspoken goal of any trip I take. 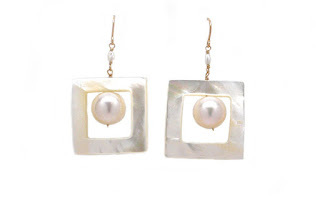 I'm going to check out those earrings--modern, yet classic. I love Dilly and her shop! There are pieces from $25.00 and up. 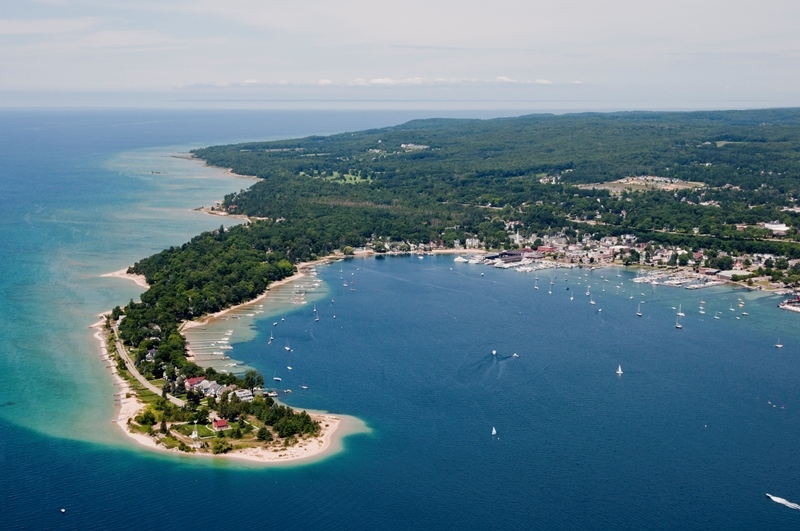 It's a must stop in Harbor Springs. Melissa: It's the "and up" that drew me! And you are right, there truly is something lovely for every budget. Wendy: I just love those earrings, and if you get them please please let me know and I'm begging for a photo. I think they are a very good buy. Janice: A favourite destination for vacationing Chicagoans... and simply breathtaking. Laura and hostess: I probably wouldn't have posted unless I could link to a website. Too cruel otherwise. Sewing: Lucky you, I had not been back there for well over 20 years. New pearl course, free for limited time!